This easy-to-follow Bible study provides an interactive way to better understand the foundational truths necessary to grow a more vital relationship with God through the study of the purpose and origin of God's written Word. It will greatly enhance your Christian life and walk with the Lord. It will spark within you a desire to become a more intense and intentional student of the Bible. This great tool for group and personal Bible sessions addresses topics such as the following: The importance of the Bible What is the Bible? What is the Old Testament? What is the New Testament? How did we get the Old Testament? How did we get the New Testament? Dr. Geoffrey V. Guns is the Senior Pastor of Second Calvary Baptist Church in Norfolk, Virginia. Dr. Guns served as the President of the Virginia Baptist State Convention (VBSC) and as the Moderator for the Tidewater Peninsula Baptist Association (TPBA). Dr. Guns serves as a member of the faculty of the National Baptist Congress of Christian Education. He has written numerous articles for the Christian Education Informer, in addition to various Sunday school quarterlies. Dr. Guns serves as Vice Chairman of the Council of Christian Education for the Department of Christian Education of the Sunday School Publishing Board of the National Baptist Convention (NBC)." 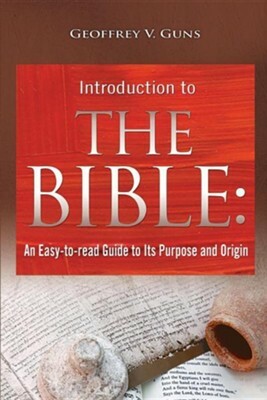 I'm the author/artist and I want to review The Bible: An Easy-To-Read Guide to Its Purpose and Origin.